No one appreciates an excuse to party like we Crusaders do, and (let’s be honest) that’s what St. Patrick’s Day is for many of us non-Irish Americans. The food is good. The beer is good. The liquor is good. Mix it all together and it’s near perfection. No one loves a good plate of corned beef and cabbage more than my dad, and he has passed this on to his daughters (well except maybe Crusader Stacy…she used to love it, but doesn’t eat beef now). We used to stand in line for hours on St. Patrick’s Day, just to have corned beef and cabbage. Some people may think it’s crazy, but to the people in that line it’s all part of the fun. Granted, there were moments when all I wanted was a chair and food, but now I remember those nights fondly. We would talk about anything and everything and it gave us one more “excuse” to hang out. We don’t get together and stand in line for hours anymore because our adult schedules, and the increasing popularity of having Irish food on St. Patty’s Day, have changed our tradition. Some years we just get together before or after the crazy day to get our corned beef and cabbage fix. But that hasn’t stopped me from wanting to celebrate the holiday in some way. Now, I celebrate with cupcakes (of course!). 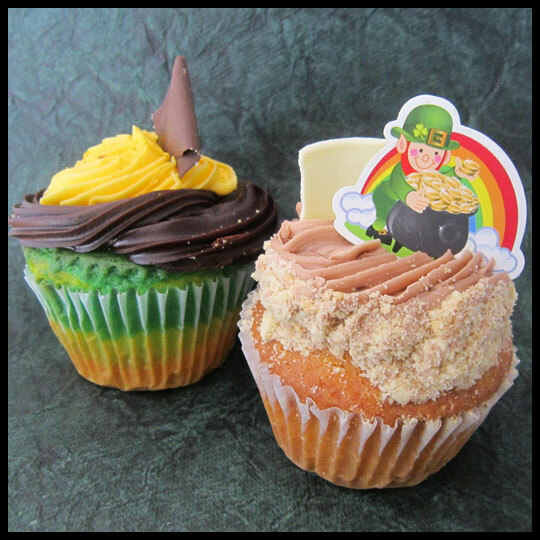 Last year we brought you a whole line-up of St. Patrick’s Day cupcakes, showing everything from sweet Baileys Irish Cream to savory Corned Beef and Cabbage cupcakes. This year I headed straight to Snickerdoodles Bakery & Coffee House with my dad and step-mom (so fitting after our past tradition!) for their holiday selection. They were offering three options: Irish “Car Bomb” which we sampled in our first Snickerdoodles review, Nutty Irishman, and Pot of Gold. This cupcake is supposed to be a combination of hazelnut and Irish Cream. Unfortunately there may have been hints of Irish Cream, but no bold flavors and I didn’t pick up on any hazelnut. However the vanilla cake was lovely; very moist and full of vanilla flavor. I have to share Snickerdoodles’ cupcakes with my husband, and he really liked it (but he’s not hard to please with sweets!). 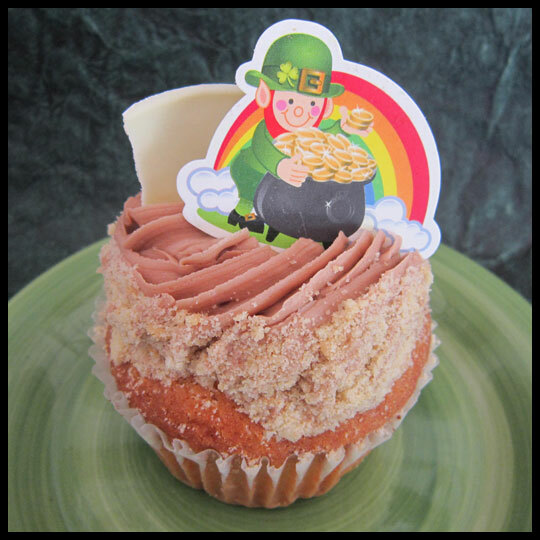 The Pot of Gold was the most festive cupcake and my favorite of the day. I loved the layering of green vanilla cake, and from the top it really did look like a pot of gold, with the dark chocolate ganache frosting surrounding golden vanilla buttercream. The center contained a surprise of golden pastry cream (my favorite! 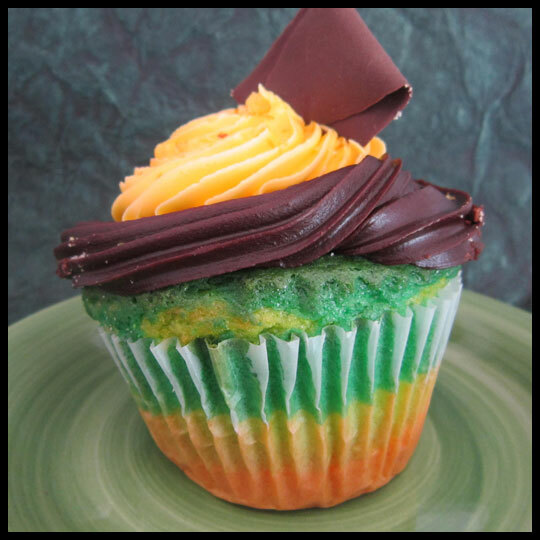 ), making this cupcake taste like a Boston Cream cupcake. The vanilla buttercream was very sweet, but since it was applied in moderation it didn’t overwhelm the cupcake. With St. Patrick’s Day coming up this weekend, we hope you all use the excuse to get out and celebrate with friends and family. 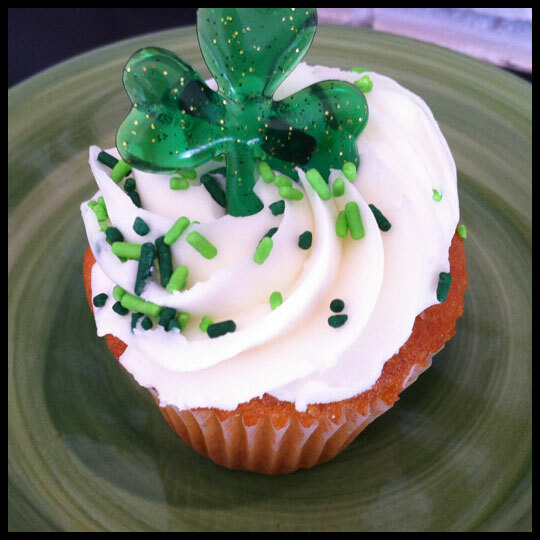 Eat some good food and sweets and don’t forget to be safe if you also enjoy a couple of Irish drinks. Happy St. Patrick’s Day! This entry was posted in Cupcakes by Crusader Jenn. Bookmark the permalink. I love your family tradition. Memories that make a family tight 🙂 Those cupcakes look tasty, Too bad you couldn’t taste the hazelnut much, I love hazelnuts. And those Pot of Golds are indeed colourful. When my dad read the post, he called me to let me know that this year my step-mom made their corned beef and cabbage dinner. Which reminds me…I STILL haven’t had any this year!